Ailsa and I have just returned from a few days break in Scotland. We went on the web and found reasonably priced tickets from Norwich to Edinburgh with Flybe. This was surprising given the Edinburgh Fringe was on, but we booked and planned a trip. We flew up to Edinburgh on Monday and picked up a car and drove to the Isle of Skye. Google maps said the journey could be done in five hours but, given two stops, for tea and supper, it took us close to eight. The first few hours were familiar territory as last year we went up to Inverness, Aberdeen and Edinburgh. This was really enjoyable but grey. On this drive we turned west 20 or so miles north of Pitlochry and immediately entered a world of lochs and mountains. The whole trip was defined by colours. The grey of cloud and mist blanketing the mountain peaks like a shifting table cloth; the reflections in the water which in turn ranged from gun metal grey to deep blue. The hill and mountains were green and purple, the peaks barren and rocky and scars of shale tipped carelessly down the sides. 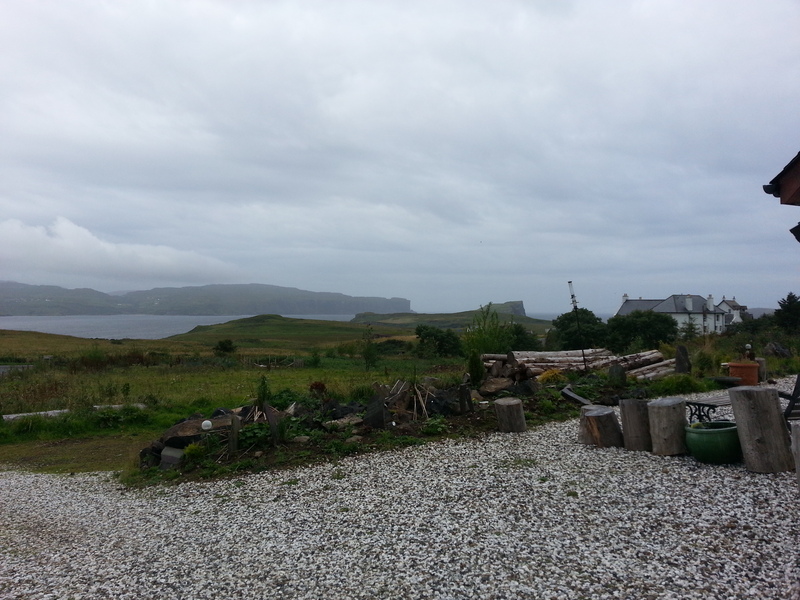 Ailsa had been on the web and found a self-catering apartment on the Ullinish Peninsula, a place called Fir Chlis. It has its own website and the pictures there are brilliant. There was one big room and bathroom, but immaculately furnished, decorated and very well provisioned with essentials in the fridge and a generous mini-bar with low prices. We arrived just before 10pm and collapsed into bed. The next morning we woke up to the most amazing view with sea, islands and cliffs. The apartment had big picture windows and so it was possible to lie in bed and look out at the scenery. Because we had driven there in the dark it was even more wonderful when we woke up. There was a full moon reflecting on the water on the clear evening, quite ethereal. And just for our entertainment, rabbits with their noses pressed against the window, although they rejected the carrots! There was some light rain on Tuesday, and indeed the only rain during the entire trip. 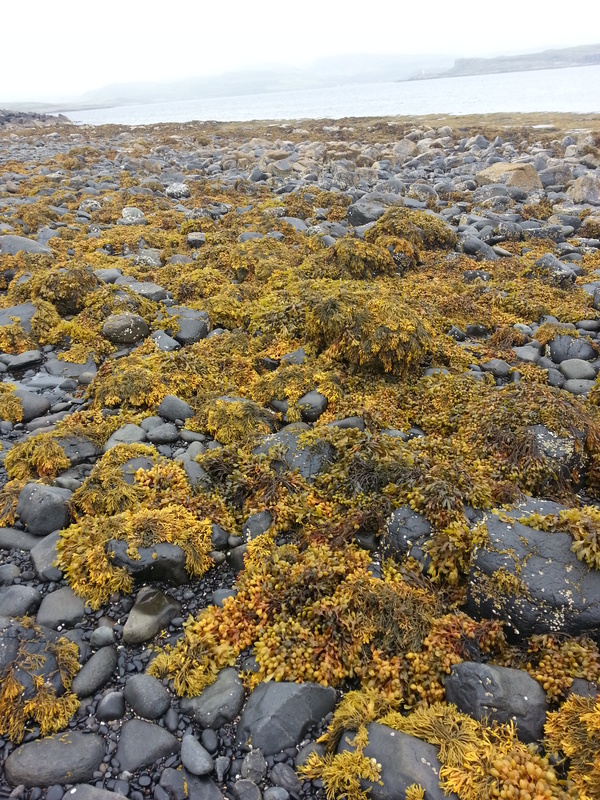 We walked from the studio to the end of the Oronsay Peninsula, crossing a tidal causeway en route. The view from the top was amazing. Looking south were the bay and lighthouse, and with a scattering of white isolated crofts nestling against the hills with the Cuillin mountains glowering in the distance. Out to sea was the Isle of Waiy, a green lump in the ocean with its skirting of cliffs. In the distance were the outer Hebrides, I think, the Island of South Uist. It was beautiful and energising. This was a good two hours of walking and scrambling. Excellent exercise and stunning scenery. After the morning’s walking we headed into the little village of Straun for lunch. This was at a little second-hand bookshop and café Mor Books and Windrush Café. It is an atmospheric place with some unusual ‘customers’. The owners seem to do a huge amount including refashioning and selling local clothing – wonderful tweed jackets. We were served a simple but excellent lunch of cheeses, salads and home-made chutneys. The restaurant in Dunvegan was run by an interesting Scotsman from Glasgow. He had spent his life installing suspended flooring all over the UK and possibly Europe. He said he loved the area and when he stopped installing flooring he moved up to Skye and took a lease on the Misty Isles Hotel. This has a number of terrible reviews on Trip Advisor but I had the freshest and nicest haddock I have ever eaten, that day’s catch straight off the boats. We drove across the island to Portree after lunch on the first day. From there we spent the rest of the day driving round the top of the island. This was my first experience of driving on single track roads. These are winding narrow roads, snaking up down and along the hill sides. There are passing places every 50 yards or so but driving is very slow and wearing. The worst part is seeing a white van looming in the rear view mirror. One knows it is a local tradesperson who knows the road and is cursing the tourists in front ‘Who don’t know how to drive!’. 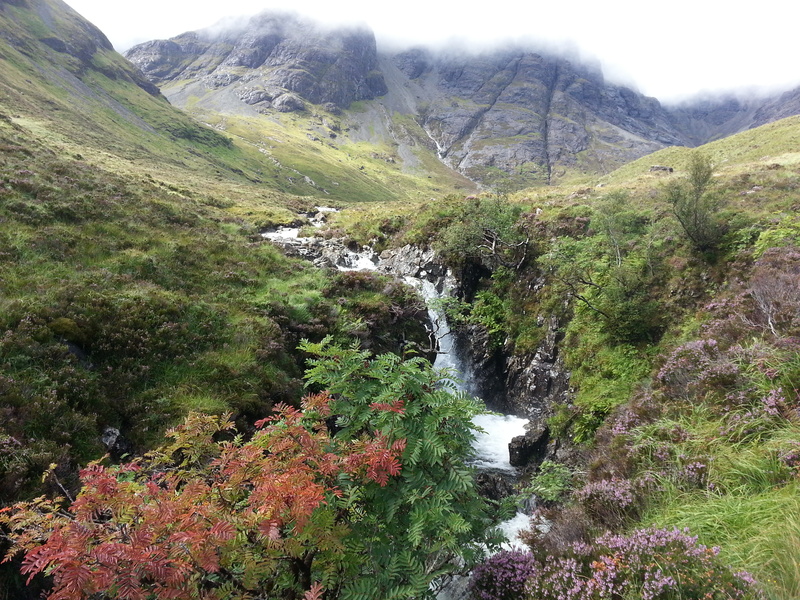 Words fail me in trying to describe the Island of Skye. It is the most astonishingly beautiful place and the views to Scotland and the other islands are outstanding. The colours were constantly changing and the blues of the sea and sky contrasted with the purple heather and green bracken. There will be a few photographs on my website in the course of the next couple of weeks. I am going to post some pictures of the scenery and two of myself. 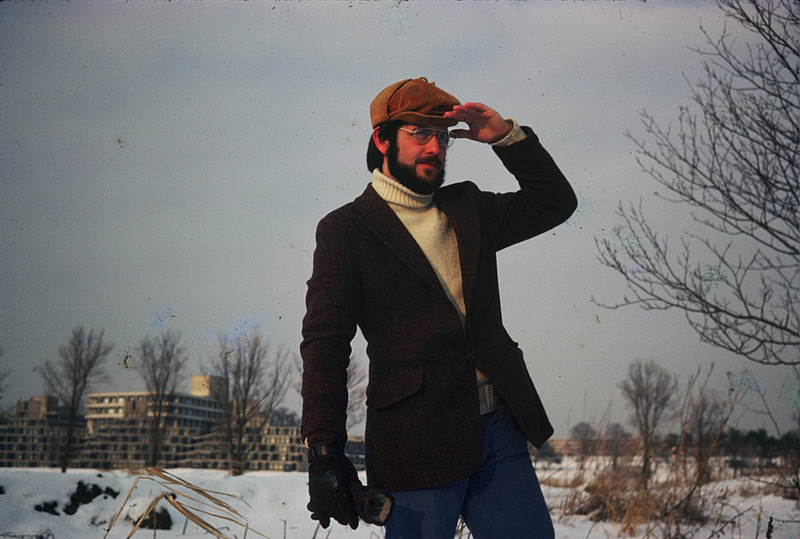 The reason for photos of me (the first was taken in 1978), is the mustard coloured corduroy hat with ear flaps, (just reading that makes it sound really unattractive, but I really thought it was cool when I bought it as a student all those years ago). It has been part of my life for 35 years. This is, I think, something of a record and the hat is just as tasteless today as it was then. 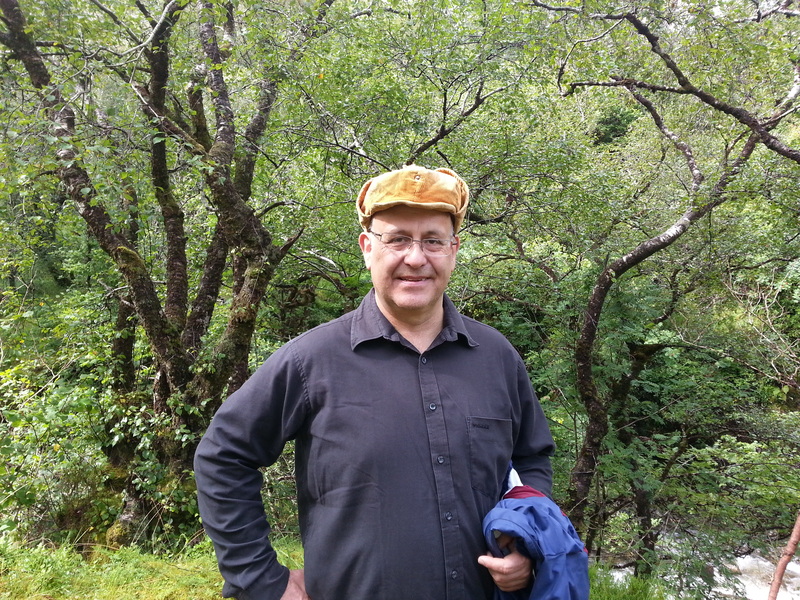 On Wednesday we headed for the village of Elgol on one of the southern peninsulas, pausing on the way to walk up a mountain beside a stream. This was about an hour’s walk going up and little bit less coming back. It had poured with rain the previous night although the day was bright, sunny and warm. We did try to take a foot path beside a loch, but it was completely flooded hence the ramble up the mountain. Parts of the path were extremely boggy and I sank to the ankle in the mud at one point. We both had plimsolls or ‘takkies’ on our feet and inevitably they got wet, or in my case soaked. This came back to haunt us as we drove to Edinburgh. We could not work out why the car initially smelt like a farmyard, and then as the journey went on it became more of a septic tank odour. The pong from the shoes was unbelievable. They were banned to the boot of the car and then wrapped in several layers of plastic for the flight back to Norwich. Lots of washing and some bleach may rehabilitate them. At the end of the holiday we took a slow drive back to Edinburgh, staying there on Thursday night at a Premier Inn near the airport. The route was through Fort William, across the Rannoch moors. We stopped in Stirling and walked up to the castle but as it was evening were not able to go in. Again stunning views and a Presbyterian little city that was beautiful in an austere way. In total we drove over 750 miles and really enjoyed it. The weather was kind, the scenery amazing, the people very friendly, and the accommodation excellent. I would certainly go back to that part of the world without any hesitation. It was interesting to try and get a sense of how the economy works in Skye. It seemed in that part of Scotland every second house is a bed and breakfast. Every café has a second-hand book section. Many of the people running the tourist businesses seemed to be expatriate English folks, who had come up to Skye with some capital and lots of dreams and optimism. There were a fair but not excessive number of visitors, and this must have been one of the busiest weeks of the year. How do they make a living? I suspect that in the winter the inhabitants must stay with each other and read their books in front of the fire. Clearly money is not the only motivator for the business people. Equally it must be tough to be a local person without money or a job with all these apparently well off visitors clogging the roads, taking pictures and standing with their mouths open. Scotland has a reputation for midges, small biting insects that can make life miserable. We watched a photographer on the beach doing the midge dance. This consisted of setting his camera up on the tripod then slapping his face and neck followed by a flapping movement. The next step was to move the camera and repeat. Fortunately the breeze kept them away for most of the time. Unfortunately I seem to attract them more than most people! So I quickly learnt the ‘midge two step and five flap’ and am available to share this knowledge. Back in Norwich it rained at last. The garden really needs this. I travel to Waterloo on Tuesday and will be there for about a month. The next instalment of the new episode!